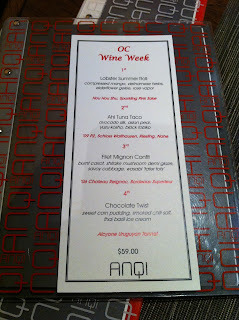 This was my most anticipated outing during OC Wine Week! 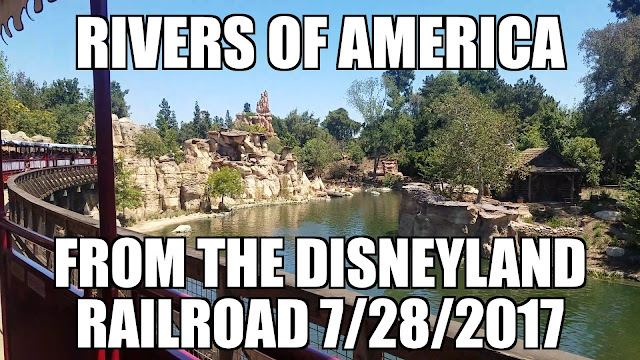 I couldn't wait to go! I went with my friend Rachelle and we have had really great luck picking some exceptional restaurants! 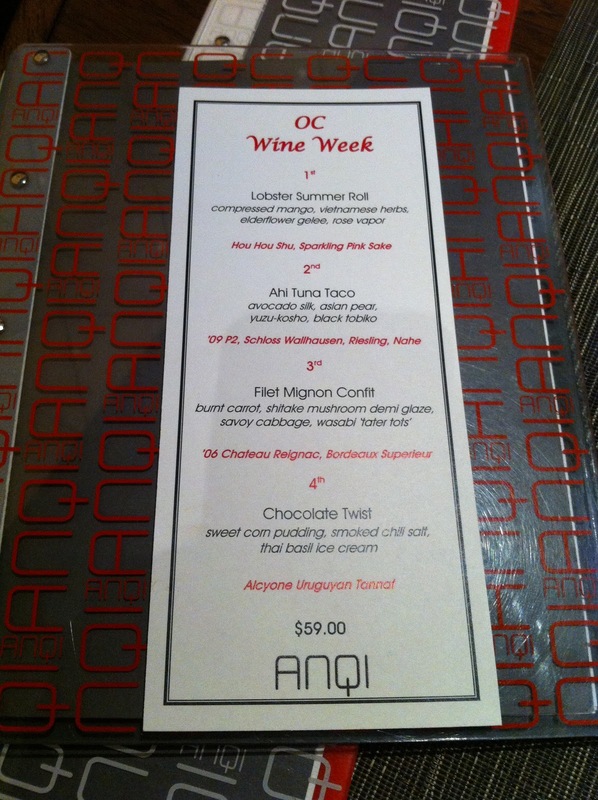 AnQi offered a four course dinner each paired with a different wine or sake. The items we enjoyed were from their molecular gastronomy menu and made for a truly unique culinary experience. The first course was a lobster summer roll that comes from their molecular gastronomy menu. It was a beautifully light and delicious tasting blend of compressed mango, vietnamese herbs, elderflower gelee and rose vapor. 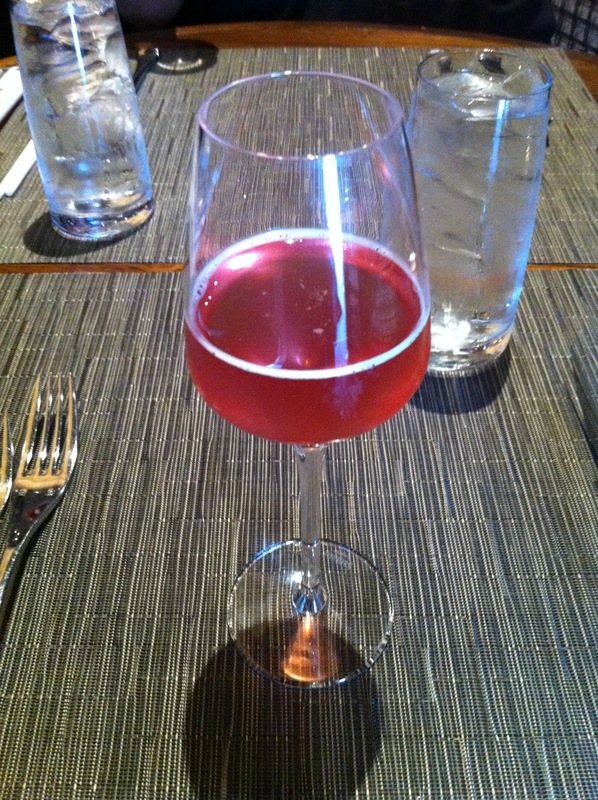 It came paired with Hou Hou Shu, a sparkling pink sake. I have found a new favorite sake. 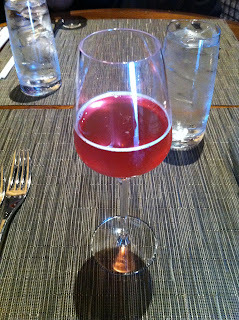 This was light and sweet and bubbly and paired perfectly with the lobster summer roll. From this first course, Rachelle and I knew we were in for a culinary treat! The second course was ahi tuna tacos. 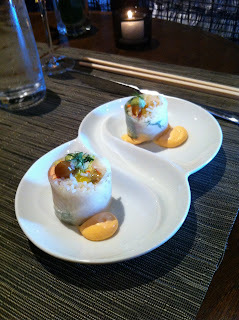 The ahi tuna was mixed just the same way as a spicy tuna roll with avocado silk, asian pear, yuzu-kosho and black tobiko. The taco shell was a reconstructed wonton shell. The flavors here once again played perfectly with one another. 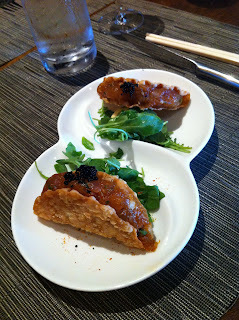 The asian pear provided a nice crispness along with the taco shell. 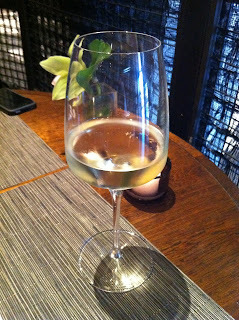 This was paired with a '09 P2, Schloss Wallhausen, Reisling, Nahe. The Reisling was dry and went well with the ahi tuna. The next course was the filet mignon confit.Truly this was the highlight of the meal for me. 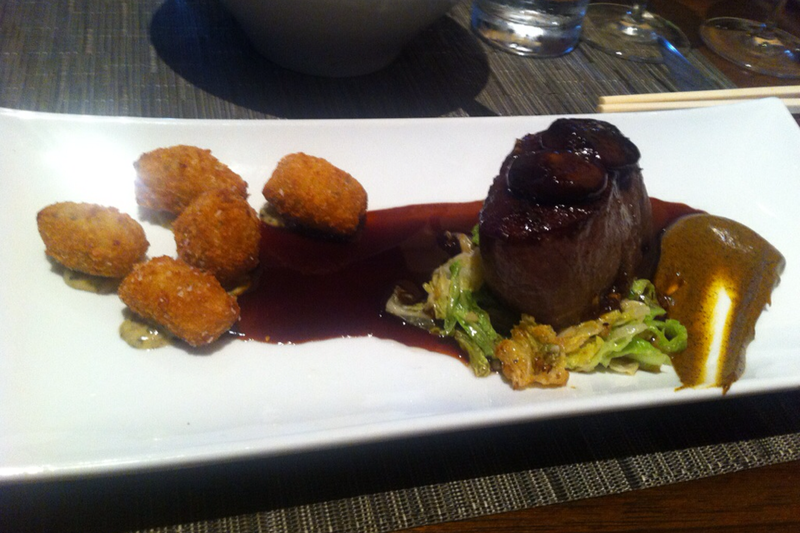 The filet was perfectly cooked to a lovely medium and was almost as soft as butter. The flavor of the meat and the earthly flavor of the shitake mushroom on top went expertly with the savory cabbage. The wasabi tater tots were gnocchi and deep fried and just delicious. 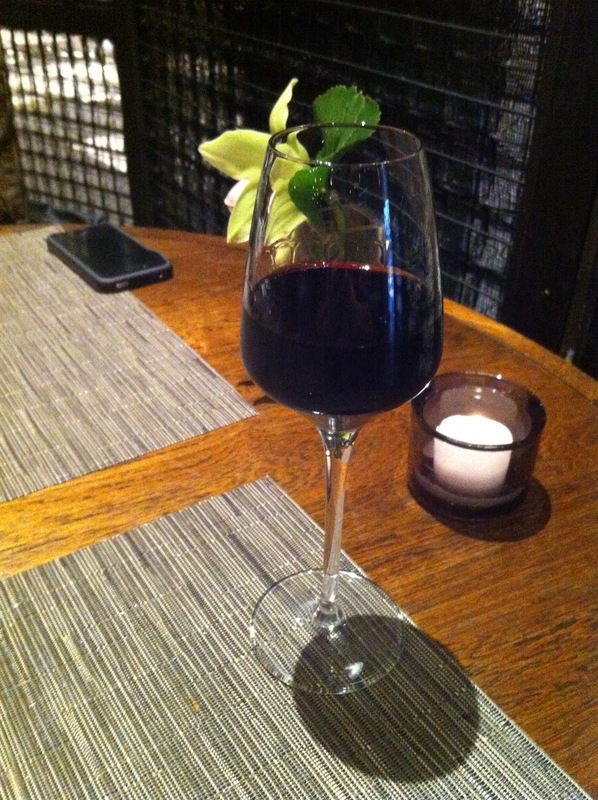 Once again it was expertly paired with a '06 Chateau Reignac, Bordeaux Superieur. The heavy red wine was the perfect compliment to the filet. We also ordered their famous garlic noodles on the side. The best part of this dish is in it's simplicity. 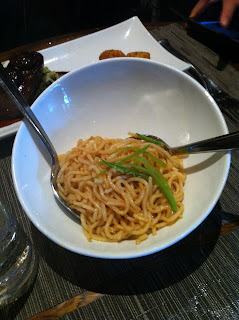 The intense garlic flavor and the wonderful noodles are just perfect to enjoy by themselves. I could eat these all day. The last course was dessert and it was a chocolate twist. It's a chocolate ganache and is well balanced with sweet corn pudding, smoked chili salt and thai basil ice cream that sits on top of a powdered version of itself. It was paired with an Alcyone Uruguyan Tannat. This soon-to-not-be-shipped to the United States port was perfectly sweet and you could taste the oak barrel that it sat in perfecting itself. A perfect drink with the dessert. 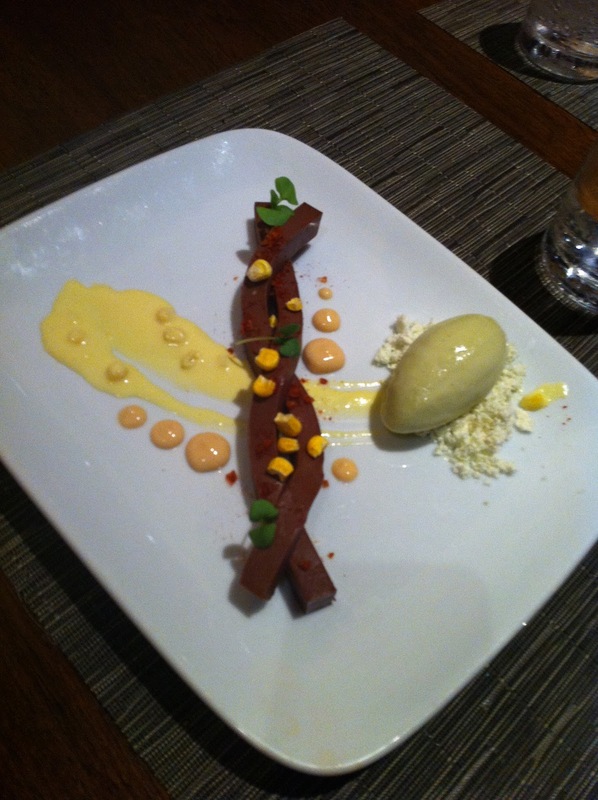 An amazing meal and the first one I have ever had in the molecular gastronomy world. Rachelle and I will be back. I also want to thank our incredible waiter Michael for his expertise with the menu and the wines we were having. He was able to thoroughly explain every dish and wine to help us "rookies". Also, I want to thank assistant general manager Matt for stopping by and talking with us and taking us through the Molecular Mondays. We greatly appreciate it and hope to bring a group of 8 or more back to experience that tasting menu! My Top Five Films (so far) in 2011! 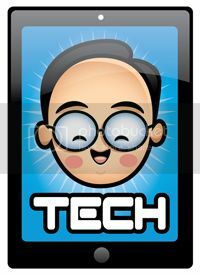 Disney Cars AppMATes make me want an iPad2! 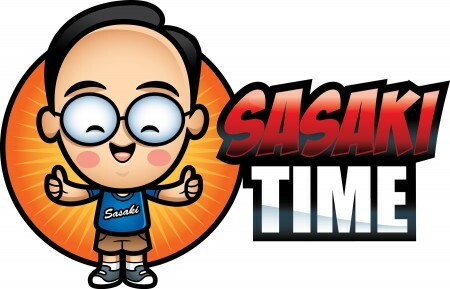 The new home of Sasaki Food Time! Star Wars Blu-Rays will be my weekend focus! Flip Flop Wines - Review coming soon! Denny's Printable coupon: Free Cheese Quesadilla! 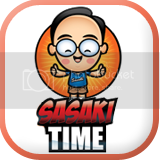 Vote for your favorite Sasaki Food Time Reviews! 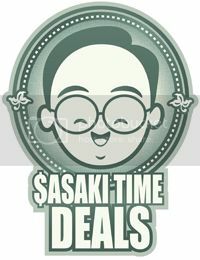 Preview of Year 2 of Sasaki Food Time! 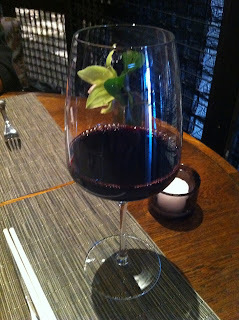 Review of Red Table in Huntington Beach!